Provenance:	Collection of the sitter Private collection, U.S.A.
Information:	This recent addition to Delacroix’s oeuvre depicts Charles de Verninac, the only child of Delacroix’s sister, Henriette de Verninac. As an adolescent, he attended the Ecole Louis le Grand in Paris, from which he graduated in 1821. During this time Delacroix served as his informal guardian and grew very fond of the boy. Upon graduation Charles returned to live with his parents in the country until the death of his father in 1822. He then returned to Paris, where he entered law school and graduated two years later. Charles worked in Paris until 1829 when he entered the diplomatic corps and received his first assignment abroad. In 1834, returning to France from a posting in Chile, he contracted Yellow Fever in Vera Cruz, Panama, from which he died in New York Harbor on 22 May 1834. Delacroix’s sister having died in 1827, Charles was the artist’s last close living relative, and his death came as a great blow. Up until his own death in 1863, Delacroix retained three portraits of his nephew, one of which hung at the head of his bed. Delacroix has posed de Verninac between a sketched-in tree on an embankment and a rocky outcropping. Dressed in tailcoat and top hat, the sitter stands close to the picture plane, before a large expanse of gray cloud edged with white against a marine blue sky. A sheet containing three different sketches of Charles de Verninac’s head has recently come to light which bears Delacroix’s studio stamp (L. 838). The sitter for these sketches has been identified as the sitter for the Portrait of Charles de Verninac by Arlette Serullaz (Former Director of the Musee Delacroix, Paris). Eugène Delacroix left Paris in May of 1825 for a three-month visit to England. “Of the French painters of his generation, he was unquestionably the most avid Anglophile, with an ample knowledge of British history, literature, theatre and aesthetic theory.” (Patrick Noon, Constable to Delacroix, p. 58). In England he saw a wide variety of British art, visited the studios of leading modern painters, sketched the countryside, and copied artworks in collections. He immersed himself in London theatre and opera and deepened his friendship with the painter Richard Parkes Bonington. This rewarding friendship blossomed to the extent that Delacroix invited Bonington to share his studio at 20, rue Jacob upon their return to Paris. The Portrait of Charles de Verninac is of particular interest in that it reflects the influence of Sir Thomas Lawrence, whom Delacroix had met in London in late July 1825. Delacroix had first seen portraits by Lawrence in the Paris Salon of 1824, the so-called English Salon. His admiration for Lawrence’s bravura technique and ability to breathe life into his sitters was soon reflected thereafter in his portrait of his close friend, the English artist Thales Fielding (1824, private collection). The lips and eyes, and rich facial colorings echoed Lawrence’s absorption of the Baroque drama of Italian artists like Guido Reni. In London Delacroix viewed additional paintings by Lawrence, both at the Royal Academy exhibit of 1825 and at the artist’s studio. At the Academy young Delacroix was able to see the full-swagger portraits by this leading proponent of the ‘English Style.’ In his book, The World of Delacroix, Tom Prideaux writes, ‘Delacroix did call on the fashionable portraitist, Sir Thomas Lawrence, noted that he was ‘the most gracious of men except when anyone criticized his pictures,’ and characteristically came away with an idea for portraiture – a single figure posed elegantly against a background of sky – that he was to exploit in his own work in the field.’ (T. Prideaux, The World of Delacroix, p. 59). Of the many portraits by Lawrence seen by Delacroix at this time, two seem to have absorbed the young artist more strongly than the others. The first was a standing full-length figure of the grand and glorious Duke of Wellington (1825, Wellington College) painted for Sir Robert Peel. The figure of Wellington is placed on an unspecified rise, his feet at angles, his form against an expanse of sky which provides a neutral background for his caped and decorated torso and head of tousled hair. 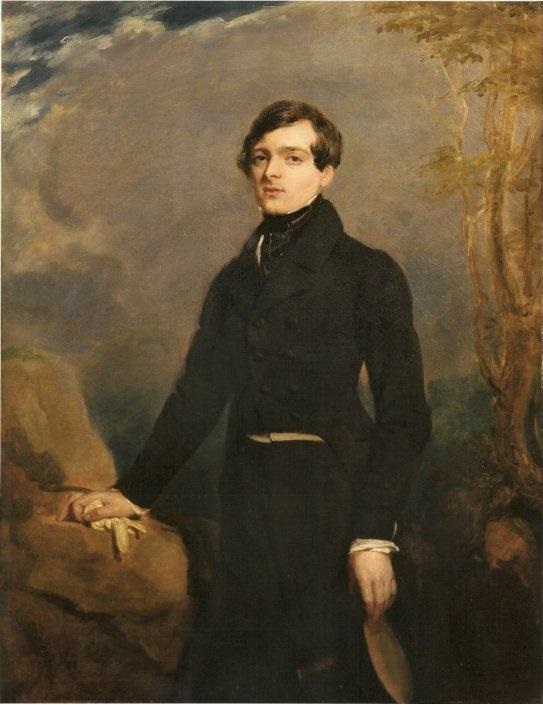 The lower half of Wellington ultimately served as Delacroix’s model for the Schwiter portrait. The second was the portrait of Master Charles William Lambton (1825, private collection). This painting of a reclining young boy some seven years of age has a visage that is pure Byron. Lawrence depicts his subject’s brilliantly painted dark hair contrasted against pearly white skin set with liquid eyes and moist lips to create a highly Romantic image. Clad in coral velvet and set against an almost atonal rock background, this figure is characteristic of Lawrence’s later work. Stylistically, the Portrait of Charles de Verninac exhibits quirks of execution germane to other works by Delacroix: Les Natchez (1823-1835), Metropolitan Museum of Art), and the Orphan Girl in the Cemetery (1824, Louvre), which bring it securely into a framework of dating and style for the 1823-1826 period. The half-length figure in the Orphan Girl is the most outstanding example. In this canvas the modeling of the planes of the faces, the execution of the eyebrows, and the translucent painting of the highlights of the hair all bear remarkable consistency with the rendering of our portrait. The depiction of de Verninac’s hand holding his hat is virtually identical in execution to the proper right hand of the eponymous Orphan Girl and to the hand of the Indian mother in Les Natchez. The rendering of the closely held fingers, the execution of the long brushstrokes toning the fingers (flossing, which he picked up from Constable) and in particular the joining of the fingers to the back of the hand are clearly all the product of the same artist. In addition, the use of groups of short parallel lines (hatchings which Delacroix refers to as hachures des sentiment) to render volume, which appear in Delacroix’s other paintings are also present in the Portrait of Charles de Verninac, notably on the fingers of the proper right hand. Of signature parity linking de Verninac with the Orphan Girl also is the execution of the white cuff that appears at her right wrist and de Verninac’s left. The rendering of the tree on the right of the composition is consistent with examples found in various works by Delacroix. His use of vertical toning of the trunk and again the appearance of groups of three or four horizontal short hatchings to indicate the curvature of the surface is seen as early as the 1824 watercolor The Lovers (private collection) and as late as the 1842 oil, Garden at Nohant (Metropolitan Museum). The most direct reference for this tree is found in a watercolor contained in his 1825 English sketchbook (Louvre, RF9143, Fo 5 recto). The application of the oil paint with its loose disposition of pigment within layers of varnish recalls the translucency of the watercolor medium in which Delacroix achieved proficiency during the mid-1820s. Much has been written about the various new techniques of paint application that Delacroix developed through his association with Bonington and others. This helped to form new relationships between watercolor and oil painting – in particular, Copal varnish used in oil paint, which allowed for rapid drying and gum Arabic combined with watercolor, which enhanced translucency. The thin washes of color that define the background and rock surfaces of our painting are the result of the experimentation being done by Delacroix at this time. The rock grouping on which the sitter rests his proper right hand appears to be the same as a formation located on his cousin’s country property that Delacroix visited often as a child and is also depicted in an 1854 oil sketch Landscape with Rocks, Augerville (Thaw Collection, Morgan Library/Metropolitan Museum of Art, New York). The pose of the standing figure holding his hat in one hand and clutching a pair of gloves at table height in the other is adapted from a portrait of Charles II of Spain, originally thought to be by Velazquez and now attributed to Juan Carreno de Miranda, that Delacroix had copied shortly after 7 May 1824. As established by Lee Johnson, the ultimate expression of this pose would be Delacroix’s 1826 Portrait of Louis-August Schwiter (National Gallery, London), which he submitted to the Salon of 1827. The lower half of Schwiter is an exact copy of the lower half of Lawrence’s 1825 Portrait of the Duke of Wellington. Our Portrait of Charles de Verninac more closely resembles the Carreno de Miranda composition and thus may well be the evolutionary step to the fully realized Schwiter portrait. Delacroix interestingly utilizes a restrained classical rendering of the figure, one of measured and tight execution, as a foil to play against the loose romantic brushwork of the background of the composition, thereby thrusting the figure in the Portrait of Charles de Verninac even more sharply forward toward the viewer, and consciously echoing Lawrence’s portraits of the Duke of Wellington and Master Lambton. Considering this work in the context of the other paintings produced by Delacroix during the mid-1820’s, it is interesting to note what a transitional piece it is. Bridging the gap between the straightforward rendering of sitters who commissioned traditional portraits from him, such as the Goubaux portraits (1824-34), and the work which the artist executed to satisfy himself and the forward motion of his mind, this work, which pre-dates the Portrait of Louis-Auguste Schwiter, combines both where Delacroix has come from and where he is heading. Footnote: At the Salon of 1839, item #224 was Louis Boulanger’s Portrait of Petrus Borel. Boulanger knew Delacroix throughout his career and worked often in his studio and knew our picture. The Portrait of Petrus Borel copies identically the figure of Charles de Verninac from the neck down to mid-shin. This is a testimony to our work having been known to Delacroix’s associates between 1825 and 1831 the date of Charles de Verninac’s departure for his diplomatic positing in Chile. While the Borel Portrait was exhibited in 1839 it is generally believed to have been painted much earlier.